In the racial and ethnic classification system used for this report, individuals are classified first by ethnicity (defined as whether someone is Hispanic or not) and then by race. As such, all references to whites, blacks, Asians, American Indians, multiracial persons or persons of some other race include those who are not Hispanic; Hispanics may be of any race. 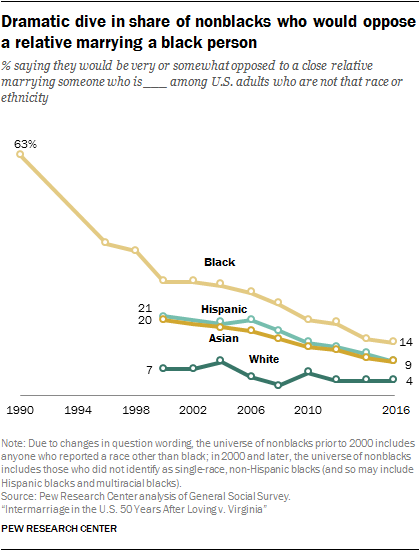 So, for instance, in the 2015 American Community Survey, 4% of black newlyweds reported that they are also Hispanic. These people are categorized as “Hispanic” in this analysis, and if they are married to someone who identifies as a non-Hispanic black, both are counted as being in an intermarriage. 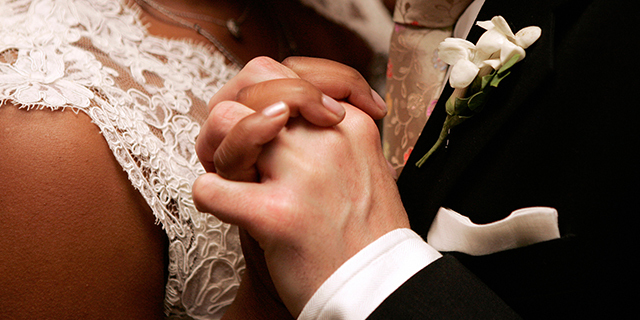 By the same token, if a Hispanic black person marries a non-Hispanic white person, their marriage would be classified as one between a Hispanic and a white person rather than a black and a white person. In the secondary data analysis, the term “Asian” includes native Hawaiians and other Pacific Islanders; “American Indian” includes Alaska natives. 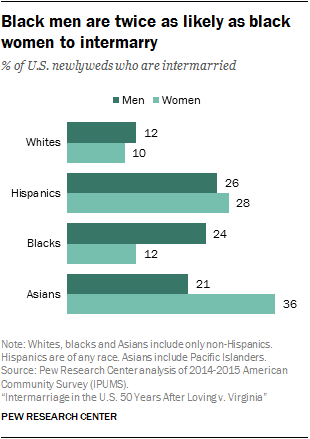 In the analysis of the Pew Research Center surveys and the General Social Survey, Asian includes anyone who self-identifies as Asian. 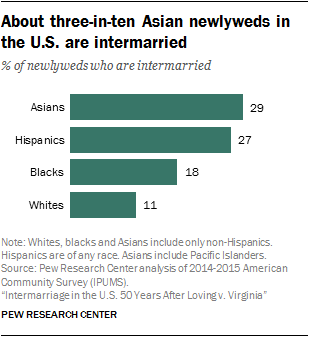 “Newlyweds” or people who are “recently married” or “newly married” include those who got married in the 12 months prior to being surveyed for 2008 to 2015 data. In all other years, newlyweds are those who married in that same year. Data analyses for 1967 through 1980 are limited to newlyweds who married for the first time, while analyses for subsequent years include people marrying for the first time and those who have remarried. People born in one of the 50 states or the District of Columbia or who were born abroad to at least one American parent are classified as “U.S. born.” All others are classified as “foreign born,” including those born in Puerto Rico or other United States territories. While these individuals are U.S. citizens by birth, the convention of categorizing persons living in the U.S. who were born in U.S. territories as foreign born has been used by the United Nations. The terms “foreign born” and “immigrant” are used interchangeably. In the analysis of educational attainment, “some college” includes those with an associate degree or those who attended college but did not obtain a degree. “High school or less” includes those who have attained a high school diploma or its equivalent, such as a General Education Development (GED) certificate. “Metro areas” in this report are classified based on metropolitan statistical areas (MSA), which consist of at least one large urban core with 50,000 people or more, as well as neighboring areas that are socially and economically linked to the core area. They are a proxy for urban and suburban areas. For Pew Research Center survey data, references to urban, suburban and rural are based on the respondent’s ZIP code. Urban residents are those who live within the central city of an MSA. Suburban residents are those who live within an MSA county, but are not within the central city. Rural residents are those who do not live in an MSA county.